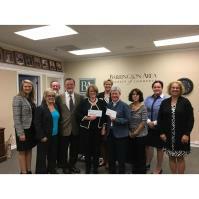 The Barrington Area Chamber of Commerce (BACC) awarded charitable donations totaling over $6000 from the proceeds of the 2018 Uncork Barrington wine-tasting event to five local charities on September 27 at its Board meeting held at the BACC office, 190 E. James St. in Barrington. Recipients of the donations were: Barrington Area Conservation Trust, Barrington Area Council on Aging, Barrington Area United Way, Barrington Noon Rotary Club, and BStrong Together. More than 900 people attended Uncork Barrington on July 6, 2018, to enjoy an evening of wine, food, and live entertainment in support of these local charities. Admission included access to over 50 wines, 20 one oz. tasting pours, a souvenir wine glass, a Passport Event Guide, and complimentary nibbles. Sponsors for the event included: Advocate Good Shepherd Hospital, Angel Water, Inc., Bath Planet, Draper and Kramer Mortgage Corp.-Dan Krucek, GK Development, Inc., Heinen’s Grocery Store, Krumwiede Roofing and Exteriors, Lori Rowe/Coldwell Banker, Marquardt of Barrington Buick-GMC, Quintessential Media Group, Shakou Barrington, The Barn Nursery and Landscape Center and Travelex International. An assortment of unique wines and delicious food samples were provided by local vendors including: Brunch Café, Cooper’s Hawk Winery and Restaurant, Francesca’s Famiglia, Garfield’s Beverage Warehouse, Heinen’s Grocery Store, Mago Grill and Cantina, McGonigal’s Pub, Neoteca, Inc., Nothing Bundt Cakes, On Occasion Catering & Events, Pepper Park Coffee, Pinstripes, PRP Wines, Remember Charlotte’s Pizza, Ruth’s Chris Steak House, UnWined of Long Grove, Vin Chicago, Wild Asparagus, and Wines for Humanity. 2018 Uncork Barrington was co-hosted by the Barrington Area Chamber of Commerce, Barrington Area Council on Aging (BACOA) and Barrington Village Association. For more information go to www.UncorkBarrington.com. The Barrington Area Chamber of Commerce presented donations from the proceeds of 2017 Uncork Barrington to five local charities at its monthly board meeting on September 27. Those in attendance for the presentation were (l-r): Amber Luczak (Edward Jones - Financial Advisor), Jennifer Prell (Elderwerks/Paxem Inc.), Joe Connelly (BMO Harris Bank Barrington), Dennis Kelly (FGMK Insurance Agency, Inc.), Kyle Kick (BStrong Together), Patty Jacobsen (Jensen Jacobsen & Associates, Inc.), Joyce Palmquist (Barrington Area Council on Aging), Andrea Herran (Focus HR Consulting), Liz Luby-Chepell (@properties | The Luby Group and 365barrington.com) and Suzanne Corr (Barrington Area Chamber of Commerce).